Our rounded cotton rolls are excellent tools for dental offices. Dentists use these cotton pads to pack patients’ mouths for dental procedures. They reduce salivation, keep the mouth open, and pull back the cheeks for better dental performance. 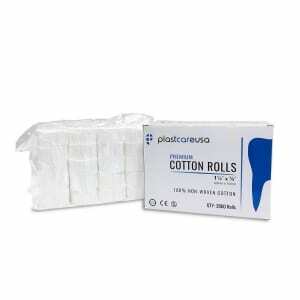 With incredible wicking action, these cotton rolls keep patients’ mouths from over-salivating, allowing you to work quickly and efficiently. They are durable, so you won’t have to keep replacing them while you are working. When you’re finished, simply remove the cotton roll. They won’t make a soggy mess in your patients’ mouths. These cottons rolls are also comfortable. Your patients shouldn’t feel any discomfort or irritation while wearing these. Their soft texture provides cushion for the mouth during procedures while soaking up excess saliva or blood. Add these cotton accessories to your dental supply to make your life more convenient. These cotton rolls also promote nosebleed relief. Place them in the bleeding nostril as a nosebleed stopper. Cotton rolls are known to be safer than nosebleed clips or blood clotting agents. They can apply pressure to your blood vessels which will effectively halt your nosebleed. At PlastCare USA, we strive to deliver quality dental products and medical supplies at affordable prices. Our products meet CE, ISO, and FDA standards. Our customers are our top priority. We work hard to give you superb customer service by using high-quality materials to create our products. Trust PlastCare USA for all your dental and medical supplies.